Yasawa Island Resort is an exclusive retreat on one of the most remote and unspoiled islands of Fiji. Just 18 luxury bungalows are hidden among the palms, each just a few steps from a pristine white beach. Swim in crystal clear waters, dive on vividly colored corals, connect with an ancient culture or indulge in Fiji’s first beachfront spa. Whatever you choose to do at Yasawa, you’ll do it in complete seclusion. Yasawa is home to just 18 luxurious bures, each one just a few steps from the beach with a view of the ocean. 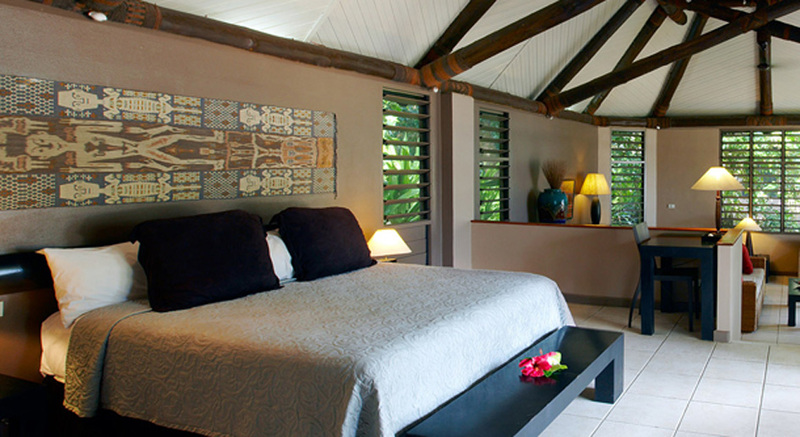 Each air-conditioned bure is superbly fitted in contemporary Fijian style, with a thatched roof, plantation shutters, an expansive sun deck, an outdoor shower, a personal hammock and a private beach hut on the edge of the sands. Most facilities and services are included in the nightly tariff at Yasawa Island Resort & Spa, delivering you an upmarket escape of great value. Among the inclusions are meals, private dining options, beach picnics, all non-alcoholic beverages including espresso, blended drinks, fruit cocktails and bottled water and activities (except spa treatments, scuba diving and sportfishing). Weddings services include transfers to the marriage registry, marriage licence, service of a church minister, floral bouquet, floral decorations, one tier wedding cake, attendants, Fijian warrior guard, champagne dinner and champagne breakfast. Additional Options include Photography and/or Traditional Fijian Wedding Costumes – both at an added cost. Whatever you choose to do during your stay, you’ll be free to enjoy it in peace. Take a complimentary picnic on a deserted beach. Visit nearby villages to meet the local children or hear the church choir. Swim in the crystal waters of the famous Blue Lagoon or snorkel among corals and tropical fish. Do as much or as little as you choose. All activities at Yasawa are included in the tariff (except spa treatments, scuba diving and sportsfishing). Children are allowed to visit the resort with their parents during special family times during the year. Stay tuned for more information about the specific time frames that will be available.